A performer has said requiring buskers to have a licence would be an ‘unnecessary hurdle’ which would stop people from performing in the streets, after the council confirmed it was considering a ‘new approach’ towards busking in Adur. Mike Green, captain of the Wellington Wailers – a 16-strong singing group which performs songs of the sea in pubs and at events – said there should be ‘no restriction’ on street performers. When the Wellington Wailers donned red noses to perform at the Shoreham Farmers’ Market on Saturday to raise funds for comic relief, they were approached by members of the council. The group was told that although they were free to continue that day – in the future, they would need to contact and alert the council in advance before performing in the street. Mr Green said they were also told that, as part of a reassessment of the council’s approach towards buskers, the council was considering requiring buskers to apply for a licence in order to perform. “It’s in the council’s hands,” said Mr Green. “It’s still early days. At the moment, nothing is certain. He said having to apply for a licence would be a ‘nuisance’. “If you had to apply for a licence every time you wanted to entertain the public, it would be a hurdle that is really unnecessary and it would probably prevent people from bothering,” he said. Were licences to be implemented, he said ‘there will be protests’. 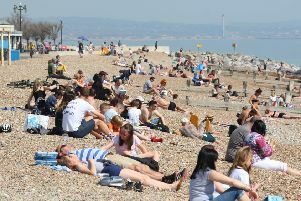 A spokesperson from Adur District Council said it hoped to share the full details of any new approach by the end of April. “Buskers and street performers often bring a welcome injection of colour and culture to the areas in which they perform,” the spokesperson said.